Dubbed as 'Destination Porsche', the new corporate architecture will meld technology and digital media to cater to Porsche's new and existing customers alike. Porsche has launched a crucial worldwide revamp project which focuses on giving its dealerships a new corporate architecture. Now dubbed as 'Destination Porsche', the new setup is aimed at a more cohesive Porsche community which provides equal attention to both the current as well as new customers. The key focus areas of the new architecture are based on enhanced use of digital media in communication with the customers and greater emphasis on brand experience. 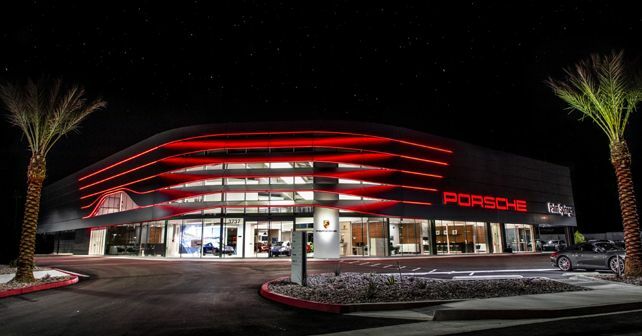 The first dealership based on this new concept was recently opened on March 15th in Palm Springs, California. While this first prototype shows the way for future changes within the 'Destination Porsche' framework, two new dealerships, coming up in Dortmund and Hangzhou, China will showcase the final concept in its entirety by the middle of 2020. 'Destination Porsche shows one of the ways we can answer the challenges of changing consumer preferences and the evolution of automotive retail,' said Detlev von Platen, Member of the Executive Board for Sales and Marketing at Porsche AG. 'Porsche stands for life dreams and for a strong community of our friends and fans. We are designing our Porsche dealerships to be forward-looking gathering places to experience the brand,' he added. 'We were approached by Porsche to be a part of something truly special and historic and we are so honoured to be able to unveil the world’s first prototype for a “Destination Porsche” dealership in Palm Springs. What began as a vision has evolved into something that has exceeded all of our expectations and frankly, our wildest dreams,' said Todd Blue, Founder and CEO of the indiGO Auto Group, the collaborator with whom the Porsche Palm Springs dealership was completed. The customer journey through the new Porsche dealership runs along various themed modules. In the Palm Springs dealership, the modules represent dedicated areas like Product Highlights, E-Performance, Certified Pre-Owned cars, Classic models, a Fitting Lounge for choosing vehicle materials and colours, Porsche Tequipment, Porsche Driver’s Selection store, an Owner’s Collection delivery area and many more. The dealership also makes use of 13 digital screens which are used for virtual reality experiences, wherein customers can experience their own car configurations. We are yet to receive word from Porsche as to when this new corporate architecture will make its way into India.